Once my garden produces an abundance of fresh herbs and vegetables, the time is right to cook Botvinka. Soups are very popular in Eastern Europe, and are the first course of a lunch of dinner meal, just like tossed salads in the US. 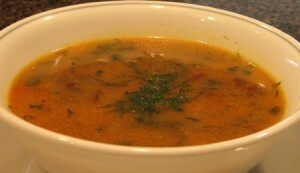 The name for this soup derives from the description of the tops (botvinka (in Polish)- leaves and stalks) of very young red beet plants, which are the major ingredient in this soup. This dish is full of goodness of fresh, young, green leafy vegetables, and because they are so tender, they require very short cooking time. I prepared this recipe in a vegetarian style, but you can use chicken, or beef, broth as the base, if you prefer it that way. Fill a soup pot with 10 cups of water, add salt and bay leave and start cooking. Chop up the onions and sauté for 2 minutes in canola oil. Chop the garlic and add to onions, add the butter, and sauté another minute. Add onions and garlic to soup stock. Rinse and pat dry all vegetables. Remove any damaged leaves and stalks. Cut off thins roots from any beets attached to stalks. Coarsely shred potatoes and carrots. Chop the red beet leaves (botvinka), chives, dill, and parsley. Set aside. Add all remaining vegetables, and cook another 2 minutes. Mix tomato paste with cream/milk until smooth, and add to the soup. Bring to boil, and cook for 1minute. Add pepper, Maggie Seasoning, and Balsamic Vinegar. Put sour cream in a cup, and add some hot soup stock (2 Tbs.) at a time, and keep on mixing it until it looks smooth, not lumpy. Add to the pot of soup. DO NOT boil again, because the sour cream with curdle. You can serve with chopped dill, and a spoonful of sour cream as a garnish. Yum! My sister and brother-in-law are coming to visit next weekend and we might just give this a try. I love beets and I’m thinking this would be a good one to try out. If they like slightly tart vegetable soups, they might like this one. You can add more vinegar to your taste. Some of our family members like to mix in a spoonful of sour cream into their soup just before eating it. This recipe was excellent!! I’m from Latvia and have missed all the different soups we have. I made this after I made borscht, and made my own beef stock with the leftover soup bones. Even my very American boyfriend liked it. Delicious! I am so pleased to hear that you tried this recipe and liked the results. My husband loves soups, so I will be posting more soup recipes in the future. I just found this recipe and am so happy to find something to do with the beet leaves I have. I have never had this soup but did grow up on beet Borscht. I am making this without the Maggie seasoning as I do not have any. Wish me luck. I am wondering what to do with the butter listed in the recipe. It doesn’t say anything in the instructions. I know what you mean. Discarding all these beet leaves seems like a waste. It must have been a very creative, or frugal cook, who created the original recipe. My apologies for the butter skip….I just updated the recipe and you add the butter to the sauteed onions at the same time you add the chopped garlic. Butter adds a nice flavor to the soup, but if you watch your diet, you can actually skip it all together. Maggie adds a nice flavor, but you can enhance the flavor with other spices, or some chopped dill weed. I hope you will like this soup. I LOVE the soup and I’m making more tonight. I did a search for a substitution for Maggi seasoning & found one that said to use Soy Sauce and Worchestershire Sauce in equal amounts for the Maggi. So I used 1 Tablespoon of each. I don’t use much oil when I cook. I actually used only 2 tsps of canola oil when I made this soup last week. Since I wanted to make this soup a complete meal I wanted to add some protein but didn’t have any meat thawed, so I stirred in 1/2 cup cottage cheese into my bowl. I learned that trick a from a recipe I found a couple of years ago. My husband who doesn’t like cottage cheese loved that soup. It melted right in. He couldn’t find the cottage cheese lumps. I am so pleased that your Botvinka soup came out great, and you and your family enjoyed it. Wow…amazing…I never thought about adding cottage cheese….my husband and I love mixing in sour cream into out veggie soups. I love cottage cheese, so I will try that next time. You know you can freeze this soup as well, for later use, but before adding the cottage cheese. Thank you for much for sharing your comments. I goofed, I should have said that I used 1/2 Tbs of the soy sauce and 1/2 Tbs of the worchestershire sauce. Good idea about freezing some soup. I did already freeze beet leaves. It will be easier that way, then it will take less space in the freezer. I’m adding sorrel leaves to the next batch I make. I think I had sorrel soup years ago but don’t remember what it was like. The stuff grows wild around here so it is easy to find. I have found some growing in my garden as weeds (I didn’t plan it), so I’ve left some to grow. I do agree that sorrel does grow wild in some places, but I have to plant mine in my veggie garden. 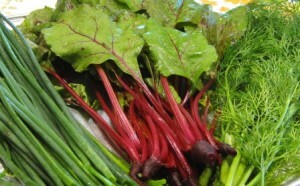 So you like red beets….so do I…please check out my recipes for red beets salads/vinaigrette and borscht recipes. I prefer warm weather, but winter is just around the corner for our area as well. Thank you for sharing your comments.